Sponsored by: LittleTikes.com - Organized by: Mom to Bed by 8 Please take a moment to read Mom to Bed by 8's Little Tikes Fun House Bouncer review and see how a boring summer day can be changed in less than 5 minutes! Kids can get their wiggles out with the ultra-fun Little Tikes State Fair Fun House Bouncer. This circus-themed set features lion, clown and dog silhouettes on the outside. A convenient exterior storage pocket offers a place to leave shoes. Three distinct areas, including a slide and ball toss area, provide plenty of room for play. High walls keep children within the unit as they jump, for reliable safety. The weight capacity is appropriate for up to three children. Assembling the Little Tikes Bouncer requires just one person, and the unit is constructed with heavy-duty PVC material. Mesh windows help parents keep a close eye on their jumping children. Special thank you to our supporting co-host bloggers: Newly Crunchy Mama Of 3, Memoirs of a Clueless Woman and Everything Mommyhood. I sometimes wish there was something like this for adults too . It sure looks like fun, doesn't it? 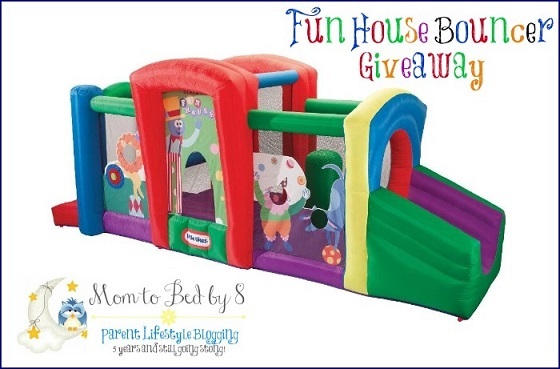 One winner will receive a Little Tikes Fun House Bouncer. Giveaway ends August 28th at 11:59pm, open to US and Canadian residents, ages 18+. Excludes Quebec. Only one entrant per household, per address. Winner is subject to eligibility verification. Enter using the giveaway form below. Good luck! Little Tikes Fun House Bouncer Sweepstakes Disclaimer: The participating bloggers were not compensated for this post. No purchase is necessary to enter. One entrant per household, per address. Void where prohibited by law. Winner(s) will be contacted by email and have 48 hours to respond before a new winner is chosen. The sponsor(s) will be responsible for product shipment to winner(s) of this sweepstakes. This event is in no way administered, sponsored, or endorsed by, or associated with, Facebook and/or Twitter, Google, Pinterest. Contact teri@mompoweredmedia.com if you have any additional questions or comments.